Direct Action Everywhere? Sure, but later, please. One would think that a discussion with, among others, Bruce Friedrich, of the newly founded Good Food Institute, and John Mackey, CEO of Whole Foods, might be an interesting and enriching chat. I for one, would see no reason not to shut up and listen. The DXE (Direct Action Everywhere) people seemed to have thought differently, and applied their usual modus operandi: they disrupted the debate. According to this article (I haven’t seen a video yet), a DXE activist opened by asking for a minute of silence and then confronted Mackey. 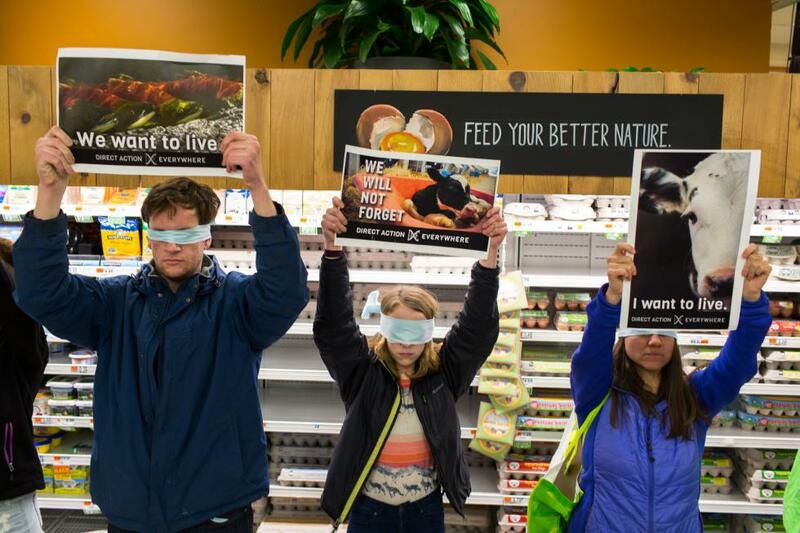 After she was removed from the room, eight protesters went to the front holding “what is Whole Foods hiding?”-signs and chanting their “it’s not food, it’s violence” slogan. I’m open to learn about DXE’s strategies and theories, and I believe in some ways these guys are more thoughtful and reasoned than many other activists, and certainly nicer than what would appear from their rather agressive (or at least intrusive) methods. Still, I can’t see the point of an action like this. I understand, of course, that there is no such thing as happy meat. I understand that Mackey holds some questionable views (though I would need to read his books and study his views more before I would want to judge them). But I’m trying to imagine being the CEO of Whole Foods for a moment. Would I be swayed by some people being what you can only call rude in a public setting, where I was invited as a speaker? Would their chanting and holding up signs etc. make me feel motivated to do something? Would I be more likely to invite these people to a meeting in my office to discuss their desires and requests? The answer to all these questions seem to be negative (though I’m not John Mackey). I’m not even talking about the question whether Mackey, even if he would want to, actually has the power to suddenly introduce dramatic changes at Whole Foods, like to stop selling meat (indeed he alludes to this here). I’m not even talking about the incredible things that Whole Foods has been responsible for in the US, providing a market to numerous producers – often new and small ones – of vegan products, and familiarizing millions of people with plant-based foods and eating. Last but not least, I was told by Bruce Friedrich that Mackey (a vegan) was actually arguing that eating meat is unethical. And this at Stanford University, a breeding place for future movers and shakers. Is DXE sure they want to attack that? Going beyond Mackey’s reaction, what does an action like this do for the movement, for animals? The DXE movement, often in the voice of Wayne Hsiung, says it’s about getting people talking, and about movement building and recruiting activists. Sure, it’s easy (well, at least not super difficult) to get a lot of press coverage with controversial actions. Sure, you might strike an emotional chord and attract a number of people who want to join you in holding signs and believing that it’s time for action. But are these really good metrics for DXE to evaluate the success of their campaigns? There is such a thing as bad press. And all these activists might be stepping into something that’s in the end not productive (the reasoning seems to be circular to me: Why are DXE actions good? Because they bring a lot of more people in the movement. Why is that good? Because these people are going to do more of these actions. But we started out wondering if these actions were good in the first place…). 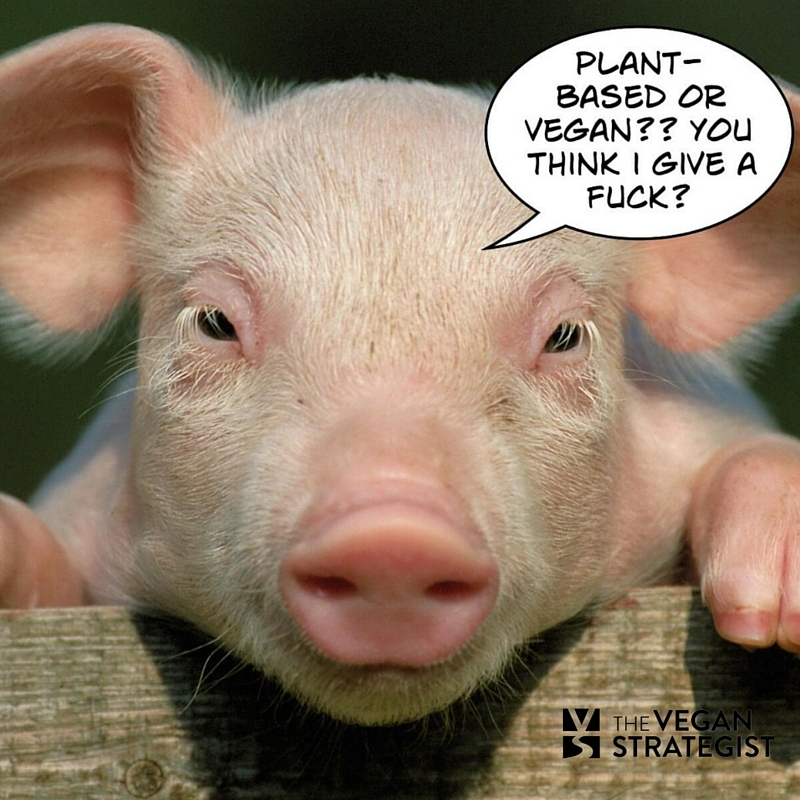 As vegans we are still fighting an uphill battle against stigmatization, against people believing we are all kinds of things: crazy, angry, negative, preaching, never satisfied… It seems to me that often, DXE actions confirm many of these perceptions. I’m not against disruption per se. But I don’t believe there is public support, at this moment, for the disruptions DXE does, and I don’t believe these disruptions can create this public support. I can’t prove this, and I’m not trying to. I’m aware of not grounding my statements in anything much except common sense and intuition here. But I haven’t seen DXE made a solid case for their views and actions either. I believe the burden of proof is on them. 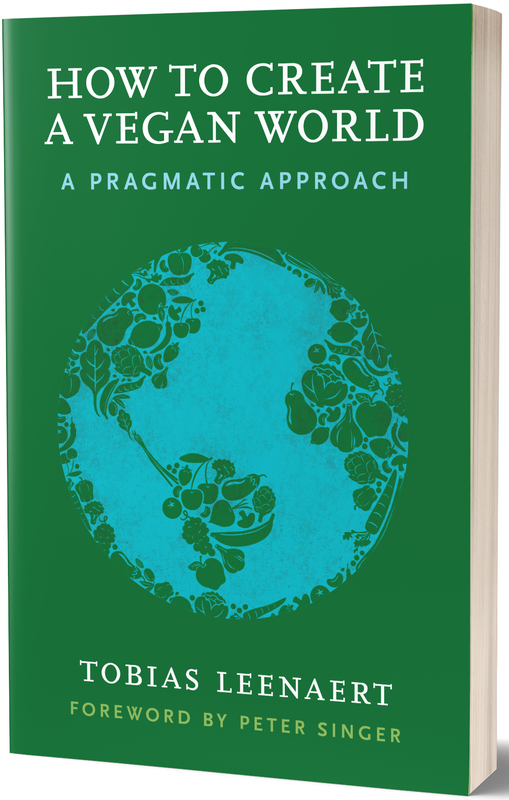 The Good Food Institute, represented in the debate by Bruce Friedrich, wants to stimulate research into and development and financing of great meat alternatives, including cultured meat. As Sam Harris recently cleverly observed in his podcast with Memphis Meats founder Uma Valeti, cultured meat could be the technological breakthrough that catalyses a moral breakthrough. This, for me, is one of the indirect tactic that Phelps described. Once there will be no more good reason left to choose real meat over meat alternatives (it is NOT the case now), we’ll have a much easier time making the point that all meat is unethical. And then DXE can knock itself out and protest to their heart’s content. Right now, I think the energy that DXE has is their best asset. I agree with DXE in that being vegan isn’t enough. We should do stuff. But I think all these caring and compassionate people involved in DXE can find ways of doing things that could be more in tune with the present times and climate, and therefore could be more effective. The author believes that the health vegans – which obviously she doesn’t want to call vegans but rather plant-based people or something – are “hijacking” the vegan movement. She wants to kind of forbid health vegans to call themselves vegan. Apart from the fact that telling people not to use a word is kind of annoying and nasty, it is also very unproductive to ostracize health vegans from “our club”. I’ve written much more on this, but just very briefly: demand for vegan products, whatever the motivation behind that demand, will raise the choice in vegan products. Vegan eating thus becomes easier, our dependence on animal products decreases, and it becomes way easier to care about ethics when people feel they don’t have much to lose anymore. The health vegans are actually among the people who are the easiest to target with an ethical message. Indeed, many “ethical vegans”(I dislike the term) started out as health vegans. I had this thought: in the end, I might get so disappointed with vegans and veganism, that I (a vegan for the animals), would refrain from using it altogether (some people say I should anyway, as I do some unvegan things!). Kind of like The Animalist is saying here. But the problem is, then the only people using the word vegan will be the more fundamentalist ones, and we’d have to start all over again with a new word. So I guess I’m not ready to give up on the word vegan yet, and rather be one more person who uses it in a rational, compassionate, positive and inclusive way. Want to join me?